Free Shipping Included! 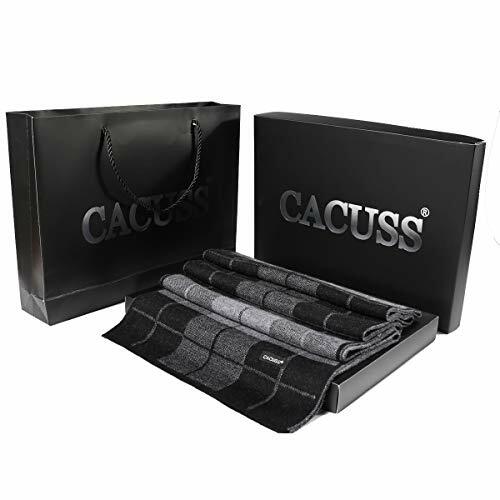 CACUSS Pure Wool Scarf for Men, Mens Scarf Winter Quality Business Plaid Scarf Warm Infinity Scarf Gift Box, Anti-wrinkle Free, Size 70.74×12.58 Inches (Black) by CACUSS at Cheap Work Clothes. Hurry! Limited time offer. Offer valid only while supplies last. MATERIAL AND SIZE:100% superfine Australian wool,soft long and smooth,warm and large cozy;70.74×12.58 inches. Because it is flexible,there may be some errors in the measurement. FEATURES:Woolen scarves,not easy to fading,shrinking and itching;thick and soft;thick and soft; Available in brown and black,Suitable for fall and winter;High-end atmosphere gift box,can be used as a holiday and birthday gift to friends,family and lover. APPLICABLE OCCASION:Suitable for business,social and almost all winter activities.Suitable for men of all ages. WASHING METHOD:It is best dry-cleaned; It can also be washed by hand with cold water and neutral washing,Soak 15-20 minutes,dry it flat. ATTENTION:Due to different monitors, there may be a little color difference in the real thing. If you have any questions about this product by CACUSS, contact us by completing and submitting the form below. If you are looking for a specif part number, please include it with your message.